British Columbia resident star lawn bowler, Pricilla Westlake from Tsawwassen LBC is no stranger to the Australian public, as she is making another trip overseas to a place which is quickly becoming her second home. Pricilla will spend the next 60 days in Australia, playing in three events. The 2018 World Youth Championships on the Gold Coast. Then down to the World Cup in Warrilla. Finally making here way to the grand stage of the Commonwealth Games on the Gold Coast. First up will be her chance to defend the World Youth title which she won last year at the Broadbeach Bowls Club in Queensland. Become a regularly at this tournament Pricilla feels confident heading into the event. I had a chance to catch up with Pricilla recently to ask her a few questions about her thoughts about the upcoming events. This will be your third time representing Canada and first as returning World Champion, are you going into the tournament any different then before? “This will be my third time representing Canada at the World Cup in Warilla. I think the combination of competing in two previous World Cups, having three Canadian Indoor Singles titles, a World Youth Championships title, and a bronze medal from my first World Cup gives me some indication of what it will take to top the podium at this year’s World Cup”. she replied. With her busy schedule over the past few months, I thought it might be hard for her to continue on with her training, so I wanted to see how that was going for her or if it has changed this time around. “Over our winter months October thru January I trained at the Pacific Indoor Bowls Club in Vancouver. I think it’ll all come together during training on these Aussie greens. You can’t quite replicate the greens you get in Australia to practice on back in Canada, so I’m looking forward to training on the Aussie greens around here before I start competition”. As mentioned she is no stranger to the Broadbeach Bowls Club and their members. Familiarity plays a big part in feeling comfortable on the greens. Is there anything in specific you are looking forward to there I asked. “I am getting to know the Broadbeach greens and the surrounding area better and better each time I compete here. This WYC will make my fifth tournament I’ve played on the Broadbeach greens. I think that will be a bonus going into the 2018 World Youth Championships and the 2018 Gold Coast Commonwealth Games that’ll be hosted at Broadbeach Bowls Club. While on the Gold Coast our WYC team will have gone on a glow worm tour in a nearby national park by the end of this trip. I’m hoping to visit the Pacific Fair shopping mall, visit Skypoint tower’s observation deck, go surfing, walk thru Surfers Paradise and visit one of the Gold Coast’s exciting looking theme parks”. Pricilla responded. 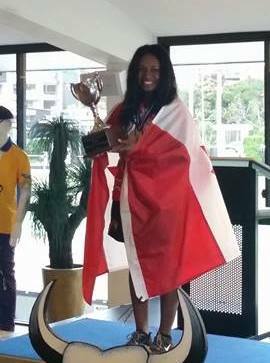 This is a little different look then last time for Pricilla, as the order of the tournaments were reversed as she hit the carpet for the World Indoor Cup first, then to Broadbeach for the World Youth event. I asked Pricilla if she had any specific preference to order of events? “I think having the WYC first before the World Cup will be good for me. It will be nice to have a change to the order events. I’m hoping the experiences of competing at my fourth consecutive World Youth Championships just before competing in the World Cup will be a good warm up for the Commonwealth Games as well”. she responded. It’s going to be another long trip for Pricilla, but with the confidence she has, knowing the surroundings, great things can happen for her over the next couple of weeks and months. She sounds ready to roll and the other Countries know that they have a tough climb ahead of them if they want to get over the line against her.